Silk screen enamel pins help you overcome the most common difficulties encountered by designers: coloured text and coloured details. As the name suggests, we add colour by silk screening over top of the hard enamel. for a unique effect, consider making a base without detail and screening on your art. Works best for a one colour design. The challenge is that the "best practice" for designing pins is to use raised base metal to render text (bronze, nickel or gold electroplate) . 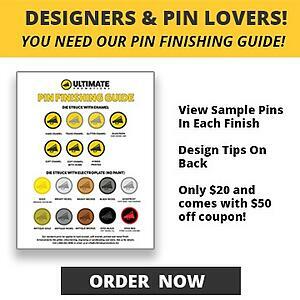 You'll find that 95% of the corporate or sport pins we sell that have text, use raised metal. It helps with legibility in most cases. Sometimes, you really want to use a specific font in the colour of your choice in your enamel pin designs. Silks screening overcomes that obstacle for you as a designer. Setting up your design for silk screening requires a bit of 'layered' thinking. You need larger areas of enamel to silkscreen over top. It's also important to use an enamel colour and silkscreen colour that create enough contrast to be legible. You should also know that it's possible to match the enamel and the silkscreen colour. Please watch our video on colour matching for more info on specifying colours. On the design below, you'll notice there is a one colour silkscreen over white enamel. 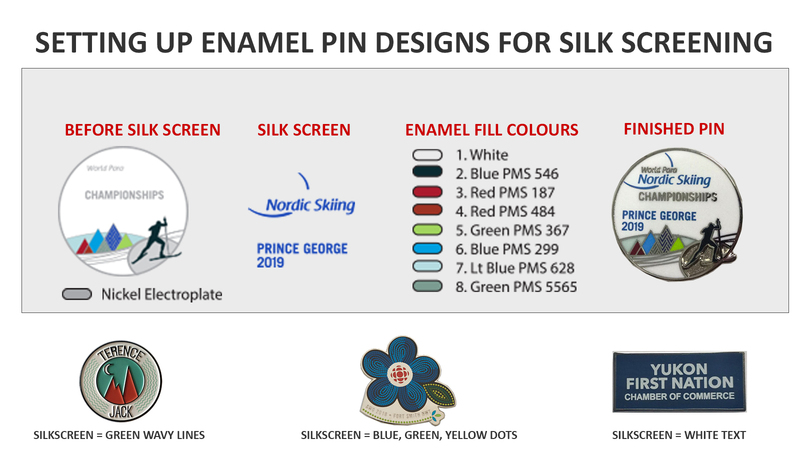 The words "Nordic Skiing Prince George 2019" are silkscreened. This video will show you how the technical side of how we administer silkscreens on enamel pins. How Do I Use Silkscreens In My Enamel Pin Designs? It requires thinking in layers. The first layer is the enamel fill. The second layer is the silkscreen. You need a large enough area to add the silkscreen. Be sure to scale your pins to actual prior to adding the silksceen. Read more about pin sizing. Once you understand what kind of detail is better handled with a silkscreen, you'll be well on your way to designing unique looking enamel pins. The CBC Arctic Winter Games pin below is probably the best use of a silkscreen we've produced in a long time. The light blue dots and dark blue dots are layered over hard enamel. You'll also notice the green dots along the bottom and CBC logo are silk screened over top of metal. Corporate graphic standards dictate we can't change how that logo works and silk screening solve that problem. Do Silkscreens On Enamel Pins Cost More? The screening process adds a set up charge and a run charge to your costs. Usually it's $30 set up and $0.10 per colour to screen. For this reason it's advisable to order at least 100pc. If you have any questions about this technique or simply want us to review what you have designed, contact us and request an art review.